Film & Video Studies (FVS) is an interdisciplinary program grounded in film and media theory and history. In FVS you will learn how to think about, analyze, integrate, and apply the foundational theories of the film/video discipline through production and theory courses. Self-motivated students can create an interdisciplinary, individualized program for further study of film, video, and developing media or to enter the workforce in a creative capacity. Students will choose between one of two majors, Film/Video Studies or Film/Video/Theater Production. The studies major is an extremely flexible major that qualifies for CLA Degree in 3, pairs nicely with a second major, or generally enables the student maximum potential for individual program development. The production major is a much more focused major, taking dedicated students through all phases and aspects of the production process. The production major focuses on hands-on, experiential education with room to develop an area of expertise (Live Events, Narrative Cinema, Corporate and Non-fiction Video, Documentary, etc.) or create a general/broad based program. Individuals who intend to work in any artistic and highly competitive field should maintain a realistic perspective about the personal and professional demands one must face in choosing such a career. While no degree or school can guarantee a livelihood in this area, Purdue's Film/Video Studies program can allow the self-motivated student to create a solid interdisciplinary, individualized foundation program for further study of film, video, and developing media or entry into the workforce in a creative capacity. Many of FVS graduates have successfully used their major in a variety of creative occupations. To maximize their job prospects after graduation, students are encouraged to develop additional experiences through internships, co-curricular projects, capstones, second majors, and/or minors. Students should also connect their career goals with their interests and abilities by actively seeking real-world opportunities throughout their college career. Selecting the right courses from within the Film/Video Studies program. Selecting complementary courses from the second major, minor, or from outside electives. Developing an portfolio of work; including internships, outside of class projects, and other opportunities. An internship is a semester or summer long opportunity to work in a campus, community, or national organization or company as a student employee. The work provides the students with opportunities to learn about various jobs and to gain exposure to occupations and aspects of their field of study that they might not have known about. Students selected for the program are expected to perform duties, meet deadlines, develop good work ethic, and behave professionally at all times. The amount of responsibility assigned will depend on both the organization and the intern’s skill level. The internship is open to ALL FVS majors and minors that have completed Technical Video Production I course with a B or better and have maintained a minimum overall GPA requirement of 2.7. Note: No university can assure a career in film, television or multimedia - your success is based solely on your personal drive, dedication, attitude, and hard work toward specific career goals. As with any other field, obtaining your degree should be viewed as the beginning of your journey, not the end. 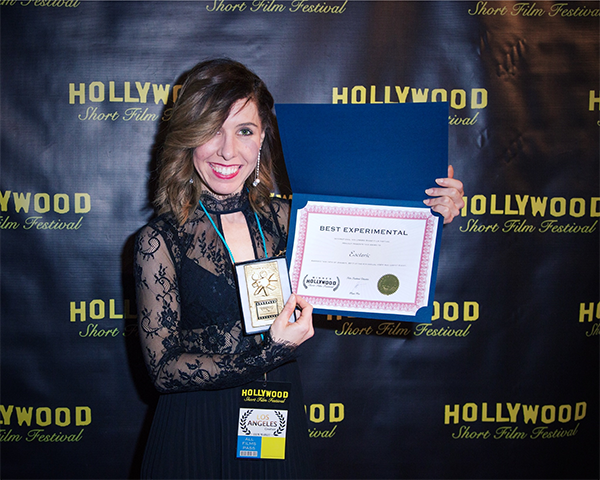 Congratulations to Mallory Gieringer, a senior in film and video studies, whose short film, ‘Esoteric’, was recognized as the ‘Best Experimental Short’ at the Hollywood Short Film Festival in Santa Monica, CA on January 14, 2017. The short film can be viewed here. 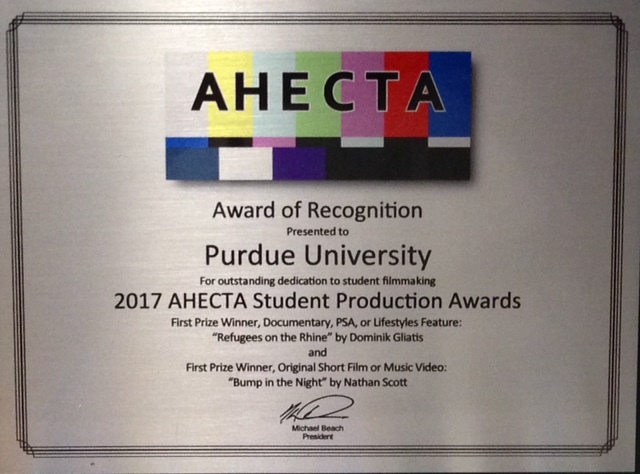 Congratulations to FVS Majors (Dominik Gliatis and Nathan Scott) who received AHECTA (Association of Higher Education Campus Television Administrators) awards.Dominik Gliatis: Refugees On the Rhine. First Prize Winner, Documentary, PSA, or Lifestyle Feature: https://vimeo.com/180748836The film is not only a great documentary and ad for a Purdue University study abroad program, it is a tribute to a different way of responding to refugees and to the Other. It seems particularly opportune at this time. Nathan Scott: Bump in the Night. First Prize Winner, Original Short Film or Music Video: https://www.youtube.com/watch?v=Z0Ip6jbUrUc To truly appreciate this film you have to use the 360 video control in the upper left-hand corner.Dominik and Nathan studied filmmaking with Dr. Bobby Chastain (FVS and Hall of Music ). Allison Heminiway, a Film & Video Studies and Mass Communications student, was included in the 2017 Student Spotlights on the CLA Website. Below is the interview which is also located on the CLA website.